The new SWALIM website is now Online! 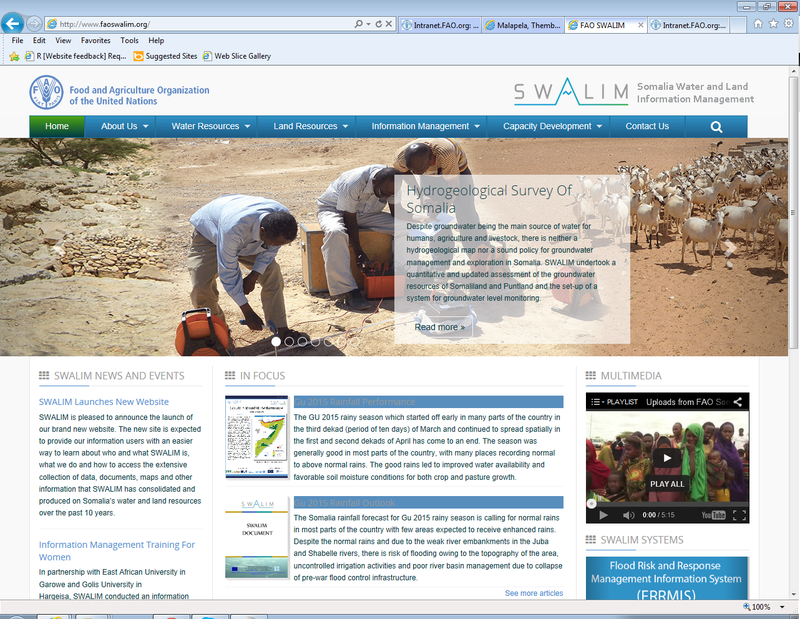 The Somalia Water and Land Information Management Project (SWALIM) is pleased to announce the launch of their brand new website on www.faoswalim.org (for reference, the old Website is still available online at old.faoswalim.org until the end of July 2015). The new site is expected to provide information users with an easier way to learn about who and what SWALIM is, what SWALIM does and how to access the extensive collection of data, documents, maps and other information that SWALIM has consolidated and produced on Somalia’s water and land resources over the past 10 years. SWALIM, the Somalia Water and Land Information Management project, is an information management program, technically managed by the Food and Agriculture Organisation of the United Nations (FAO) in Somalia and funded by the European Union (EU), the United Nations Children's Fund (UNICEF) and the Common Humanitarian Fund (CHF). SWALIM serves Somali government institutions, non-governmental organizations (NGOs), development agencies and UN bodies engaged in assisting Somali communities whose lives and livelihoods depend directly on water and land resources. The program aims to provide high quality water and land information, crucial to relief, rehabilitation and development initiatives in Somalia, in order to support sustainable water and land resources development and management.